Roy Cohn has a very special place in American history and theater literature. The man who was a key character in the McCarthy Communist investigations was also a key character in Tony Kushner's Pulitzer Prize masterpiece Angels in America. 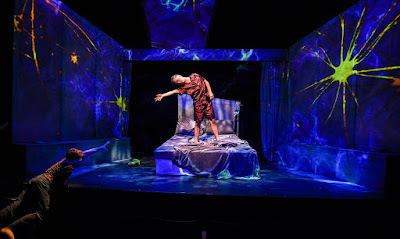 Cohn has found himself a character in various other pieces of media but when it comes to theater, he is associated with Angels in America. So why try to out-write Kushner's Cohn? A challenge I suppose. In Joan Beber's absurd play In Bed With Roy Cohn, we watch as the AIDS ridden Cohn unravels physically and emotionally, projecting key figures from his past before he expires. It's inevitable to compare In Bed With Roy Cohn to Angels in America. Not for its prolific writing but for many parallel similarities. While Kushner haunts Roy with the ghost of Ethel Rosenberg, Beber gives her Roy Ethel's husband Julius. In Angels, Prior awakes from a dream and recites a line from "The Wizard of Oz". Beber's Cohn does the same. Comparisons aside, In Bed With Roy Cohn may have displayed Cohn’s struggle with reality and sanity in a fever dream manner, but the piece seemed to lack purpose. There was no journey to the character aside from watching Cohn rekindle relationships with his past including his mother, his younger self, his young male lover, Barbara Walters, and Ronald Reagan. Beber didn’t try to paint Cohn in a better light or have the past alter his fight to hang on longer or come clean with his insecurities, instead it was an absurdist approach to an unredeemable life. There is virtually no answer to “why this story now”, especially after already having a theatrical version of Cohn’s life. Nothing new was presented, unless you count bringing awareness to the cover-up relationship Walters and Cohn had. The other major problem with the script is Beber relied on quotes to further the plot. From Shakespeare to “Gone With the Wind”, the quotes sometimes played a bigger role in the story than Beber’s actual text. Using these overabundant quotes as a crutch to tell Cohn’s story proved the lack of substance in the script. Where In Bed With Roy Cohn lacked in substance, it surely prevailed in production value. The glitz and glamor were in full force to provide a visually stunning piece. The set by Sarah Edkins was simple with a skewed view of a bedroom with trap doors and surprises all over the place. The grey toned set allowed the lights and projections by Gertjan Houben to flourish and add a captivating visual distraction. The music by Andy Evan Cohen was quirky and weird, matching the tone of the show. Director Katrin Hilbe and choreographer Lisa Shriver precisely choreographed the piece, allowing the story to move lithely. But you cannot deny that the visual appeal greatly assisted in hiding the problematic script. Strip the design away and In Bed With Roy Cohn is left with nothing. The absurdist comedy had a certainly committed ensemble. And you can make the case that some of their characters should be committed to the loony bin. As Roy Cohn himself, Christopher Daftsios brought promise. He did his research and could easily portray Cohn in a production of Angels in America. There was a natural tenacity in his demeanor but seldom did it change. The interesting aspect about In Bed With Roy Cohn is that when presenting a well-known character, it bordered on spoof rather than fact. Nelson Avidon as Ronald Reagan and Lee Roy Rogers as Barbara Walters took more of a “Saturday Night Live” approach to their characters. It’s what the writing called for. Rogers nearly replicated part of Gilda Radner’s character. The non-celebrity characters followed into the over-the-top style as well. Rebeca Fong, who stole the show as Lisette, and Marilyn Sokol as Dora, Roy’s mom, were whacky and crazy. The only grounded and interesting character seemed to come from the silent and agile Andy Reinhardt as Young Roy. Reinhardt and Daftsios supplied the only honest human connection, despite virtually being the same person. In Bed With Roy Cohn seemed to suffer the same fate as Iowa at Playwrights Horizons. While this show was certainly more pointed, the play was just an assortment of ideas with no rhyme or reason. Roy Cohn’s journey to death may be interesting for a scene. But it’s been done before.